It’s a little bit like watching a rare and beautiful beast sacrificed in an elaborate motorsports ritual. And because of this, it can be a little hard to watch. 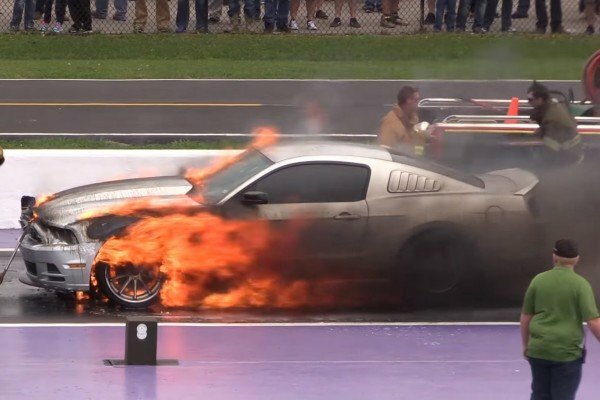 A 2015 nitrous-charged Mustang caught fire March 18 at the Tx2K drag racing event in Houston. Let’s start with the cost, and then we should say a thing or two about the age-old practice of running nitrous to supercharge an engine. And of course there’s the whole thing about gas tanks and explosions. But first, the money. Racers can spend upwards of hundreds of thousands of dollars for an effective custom drag racer, only to see it all go away within minutes when a nitrous upgrade mishap sparks a fire under the hood. Of course, the same gas is used to make a patient relaxed and happy at the dentist, but there is little or no laughing when the car goes up in flames. Using nitrous oxide to go fast, as it turns out, is an idea first tried by the Nazis during World War II. They just keep on giving, those Nazis. The Luftwaffe ran the gas to supercharge their planes, trying for an advantage in the air, but the practice never really took hold. By the 1950’s, once we’d vanquished the Great German Performance Engine Testing Machine, muscle car drag racers had turned to nitrous as a relatively cheap performance enhancer. Amateurs as well would outfit with NOS to gain a racing edge, but everybody knew that the increase volatility ran the risk of fire. But why would such a small risk stop anyone from going very, very fast? Watching the fire crews work to put the mustang out, first with hand-held ABC extinguishers and then with the help of an engine that for some reason parks upwind from the blaze, we can’t help but sit on edge waiting for the flames to make to to the fuel tank, creating an impressive fireball. None of the attempts to put out ht fire seem to do any good, and the stiff breeze only serves to fan the flames and blow away any retardant. For certain, it’s like watching a ritual sacrifice, and we can only hope the insurance is up to date.